Let’s take a Renzo Piano architecture in Rome, Auditorium Parco della Musica, put inside (and outside) it digital professionals, engineers, artisans, designers, makers (?!? ); mix them and add 3D printers, innovative technologies from all over Europe, robots, drones and all types of Arduino applications. Garnish all this stuff with the secret ingredient (15.000 students!) and that’s the recipe for the Maker Faire Rome! The Mak-ER roadshow started in New York in late September, and continues its European edition of the Maker Faire in Rome. RI///FLUX by MakeRN, an interactive multimedia system that allows to create sensitive environments, paths, and interactive digital sets. During a light talk on Sunday 5th October we explained the birth of Mak-ER, the final goals of our work, the achievements and the challenges that we are facing and future steps. Most of the labs had their own talk and it was a big common success! 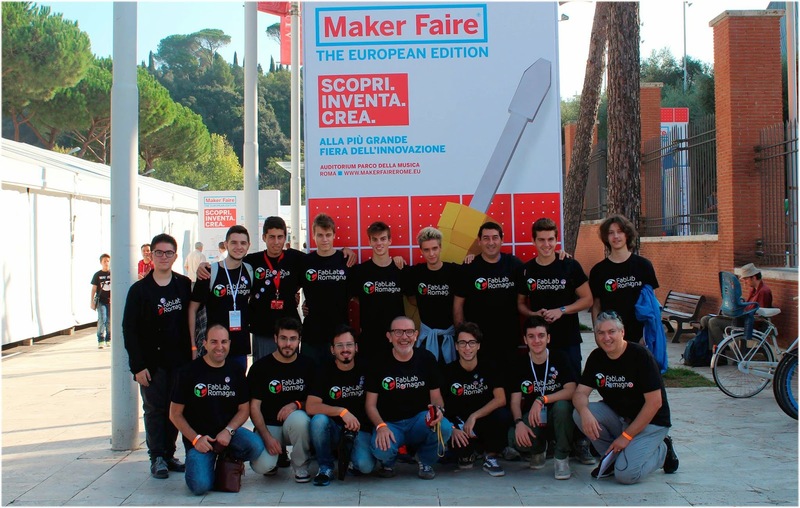 Some of them also received the prize “Maker of Merit – Maker Faire Rome 2014”! We described our project to the Foundation Make in Italy and to all the fablabs and maker spaces which were attending the faire. Associazione Make in Italy, which is sustaining us, confirmed its support. It’s a long road but we’re going on the right way!